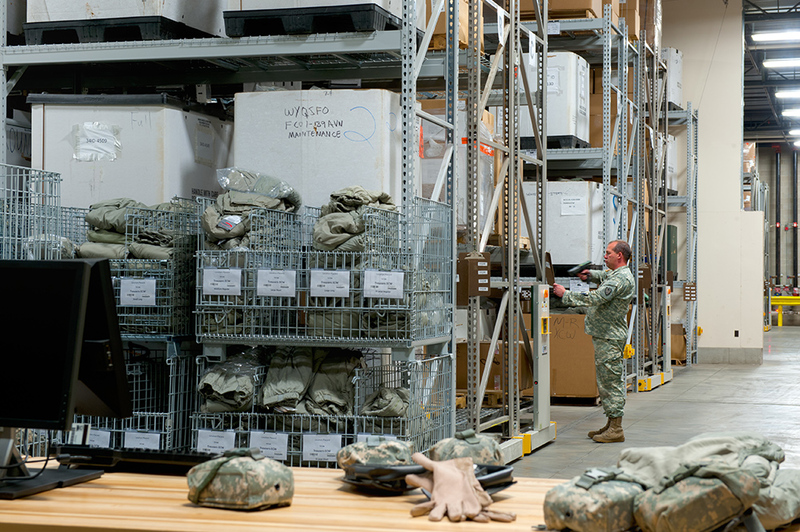 Storing twice as much equipment & clothing for National Guard Soldiers—without a facility expansion. Camp Ripley provides 11,000 National Guard Soldiers easy and immediate access to critical equipment. 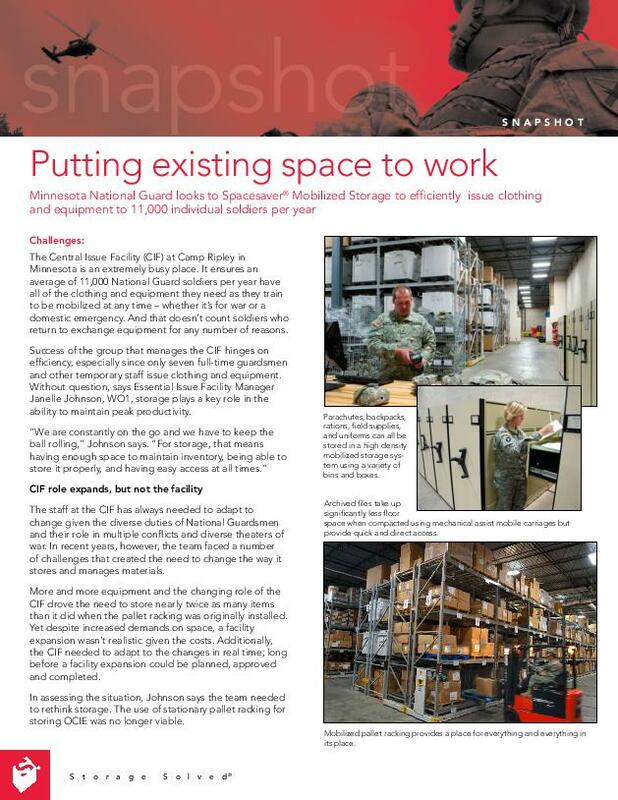 The Central Issue Facility (CIF) at Camp Ripley in Minnesota is an extremely busy place. 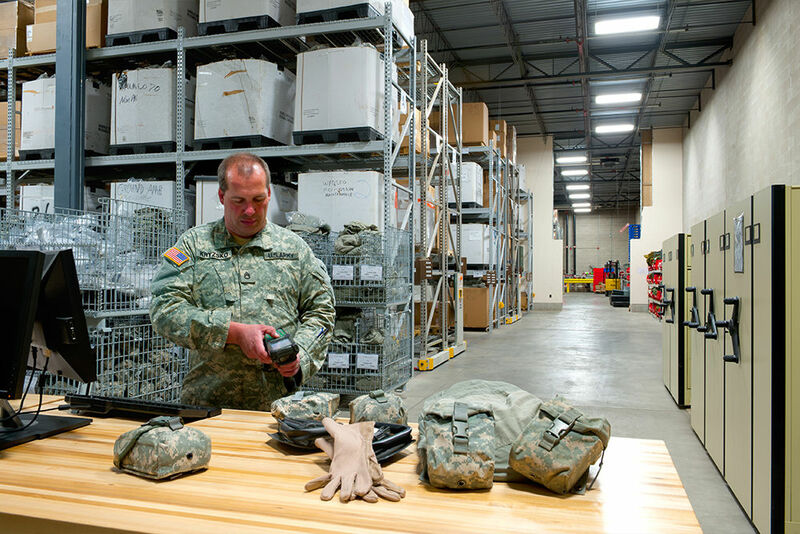 It ensures an average of 11,000 National Guard soldiers per year have all of the clothing and equipment they need as they train to be mobilized at any time—whether it’s for war or a domestic emergency. And that doesn’t count soldiers who return to exchange equipment for any number of reasons. More and more equipment and the changing role of the CIF drove the need to store nearly twice as many items than it did when the pallet racking was originally installed. Yet despite increased demands on space, a facility expansion wasn’t realistic given the costs. The CIF needed to adapt to the changes in real time; long before a facility expansion could be planned, approved and completed. In assessing the situation, Johnson says the team needed to rethink storage. The use of stationary pallet racking for storing OCIE was no longer viable. An ActivRAC 16P Industrial Mobile Racking system was designed around the physical space at the CIF and in such a way as to allow quick and easy access. Located behind the counter where soldiers pick up OCIE, it features five mobilized carriages, four of which are 74 feet long. The fifth carriage stretches 93 feet to capitalize on additional room for storage. To create even more room for OCIE storage, more than 40 vertical file cabinets were replaced with a mobile storage system. Now more than 11,000 soldiers have better, faster access to the equipment they need—exactly when they need it.